For installation instructions and help, click here. Open a song by clicking File > Open and selecting an audio file and save location. Most common audio formats are supported, but files with DRM, such as m4p will not work. MIDI files can be opened in order to create sheet music, but all instruments will be played with piano. 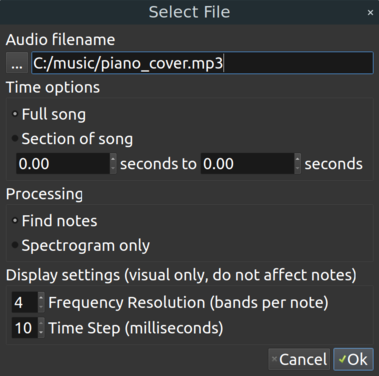 You have the option to process only part of a song or skip finding notes and just generate a spectrogram display. You can also increase the frequency resolution and/or decrease the time step if you want a higher resolution image. A higher resolution image will take longer to generate, but doesn't affect the automatic note detection accuracy. You can add additional songs to the file queue while the song is being processed by repeating the above steps. If you add songs one at a time, the open file dialog will pop up and you can adjust the settings. If you add multiple files at once, they will be transcribed using the default settings and saved to the "Default Save Folder" listed in File > Preferences. To cancel a song, click the red X next to it. It can take several minutes to process one song. To reduce the wait time, process the song in parts (such as 0 to 30 seconds, then 30 to 60, etc.) or use a computer with more processor cores. Notes (blue rectangles) and candidate notes (white). Right clicking will add or remove a note. Notes are blue rectangles labeled with the pitch name. You can add or remove notes by right clicking in the grid square where the note starts. The grid of possible note start and stop points is based on the smallest allowed note can be changed with a drop down box in the side panel or by repositioning the beats (see the section on editing measures). You can change the start or end point of the note by left clicking near a note edge when the cursor is a double arrow and dragging it to a new location. By default, each note ends where the next note starts. Once you drag the note end point, it will stay fixed at the new point. If you want to reset a note end point to auto-end at the next note, right click on it twice to remove it and then add it again. Candidate notes (white) show where the detection algorithm was less sure of a note. Candidate notes are simply suggestions and will not show up in sheet music. All notes are assigned to the same voice. To edit the voice of a note you must save a musicXML file and edit with a music notation program. The note threshold slider allows you to adjust the number of notes based on their likelihood score by setting a threshold. When the slider is at 0, there will be no notes but many candidates. When the slider is at the maximum value all the candidates will have become notes. The candidate threshold slider lets you see more or fewer of the candidate notes. When you select a region by clicking and dragging over the display area, keyboard, or timeline, the note threshold slider will only apply to the selected region. The delete key will delete any selected notes. A single left click anywhere in the display area will clear the selection. The red reset button will reset all note thresholds, restoring the original notes in the selected region if a selection exists, or for the whole song otherwise. Any notes manually added by right-clicking will be kept. Key/time signature or tempo: these can be changed with number boxes in the measure tab in the side panel. To remove a tempo or key/time signature annotation, set the value so that it matches the previous measure. Changing the bottom number in the time signature only changes the sheet music annotation--it does not alter the number of measures. So to convert 3/4 to 6/8, for example, you also need to halve the number of measures. Double or halve the number of measures, from the selected measure onwards. A "halve" will undo a "double" if performed from the same location. A double will usually undo a halve, but key/time signatures and tempo annotations may shift when halving. Halving deletes every other measure and any annotations from deleted measures are placed into adjacent measures where possible. Add a single measure immediately following the selected measure or remove the current measure. It's best to make the biggest changes first: edit time signatures, then the number of measures, the positions of downbeats, and finally the position of beats within measures. There are three playback buttons to play audio: music only, notes only, and music plus notes. A dropdown box allows you to select what section of the song to play. 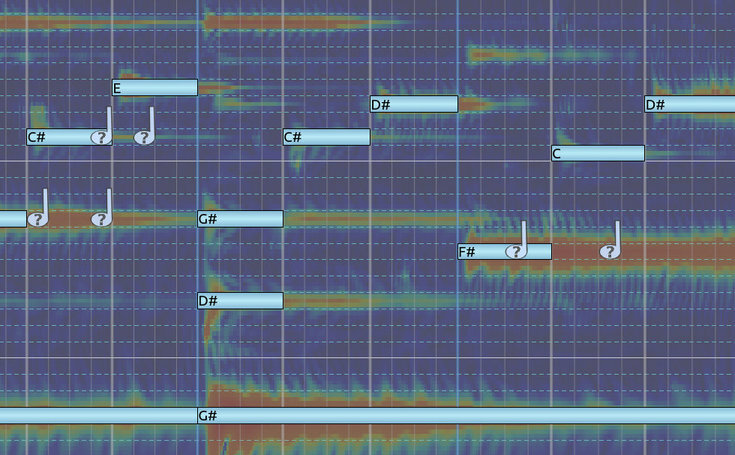 'Selection' plays the region selected by clicking and dragging on the spectrogram or timeline. If no region has been selected, the audio visible in the window will be played. 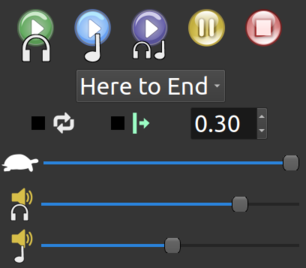 'Here to end' plays from the audio in the current window to the end of the song and 'Start to end' plays the whole song. The 'loop' checkbox (shortcut key 'l') repeats playback. The speed slider changes the tempo without changing pitch. Beneath that are the music and note volume controls. AnthemScore has a built-in viewer for sheet music. However, if you have a music notation program like Sibelius, Finale, MuseScore, LilyPond, etc. you can link this program in AnthemScore (File > Preferences) and the external program will be used instead to view sheet music. To use an external editor, select the "use external program" radio button and provide the path to the application (.exe on Windows). The green sheet music button will save any edits you have made to the notes and open the sheet music with the default save settings. Sheet music is saved as a musicXML file in the default save folder listed in preferences, unless you specify a different path when opening the audio. You can save the sheet music with custom settings by clicking File > Save As. 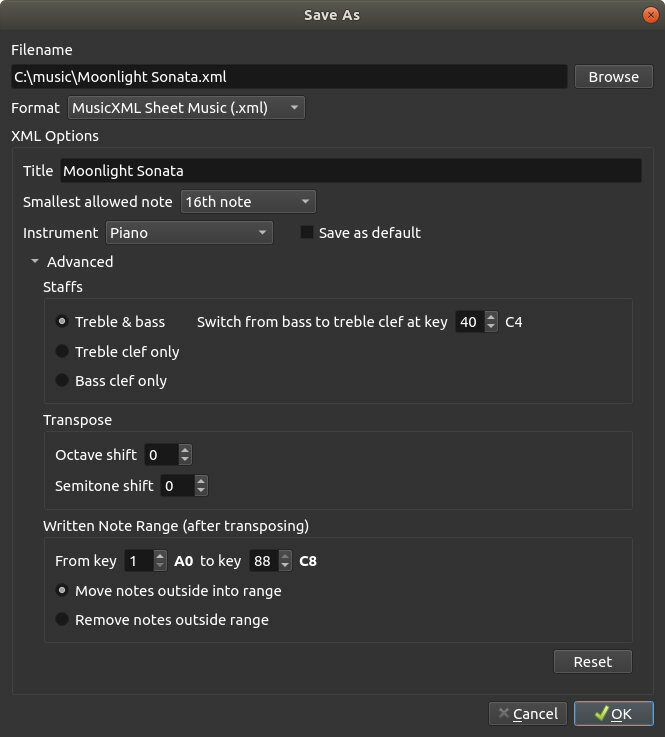 MusicXML is a common sheet music format supported by all major music notation programs. To see the options for saving files from AnthemScore, click File > Save as. 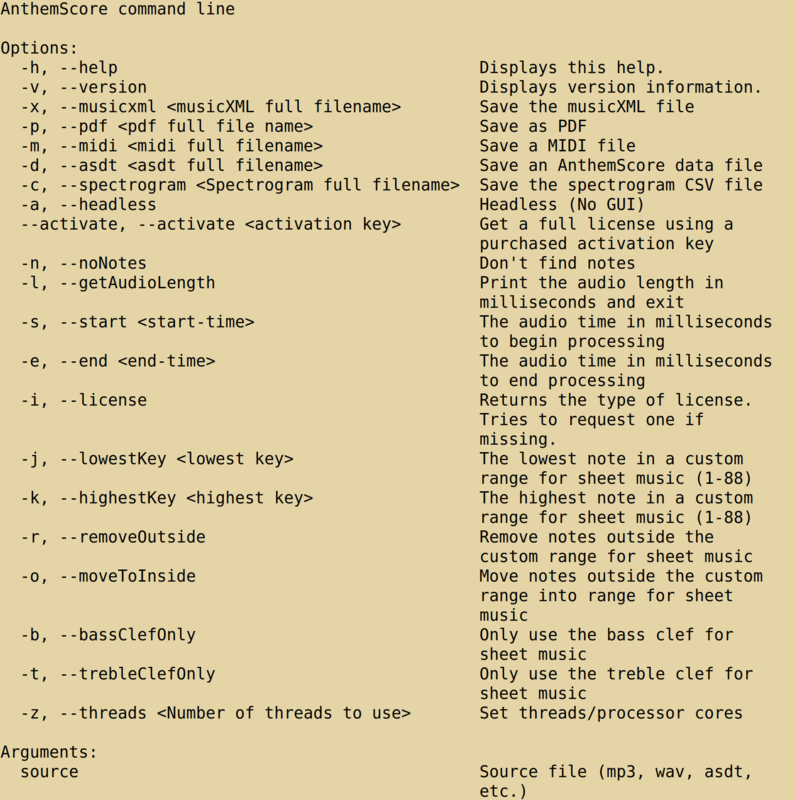 AnthemScore Data File (asdt): a file storing the current session with all edits. You can open an asdt file like would a normal audio file. An asdt file contains more information than MusicXML. You can open an asdt file and then save it as MusicXML, but not the other way around. Spectrogram Amplitudes (csv): A simple text file containing raw spectrogram data. The 1st line in the file is a list of frequencies. The 2nd line is a list of time values. The 3rd line onwards give amplitudes with time across rows and frequency across columns. The shortest note allowed to show up in sheet music. 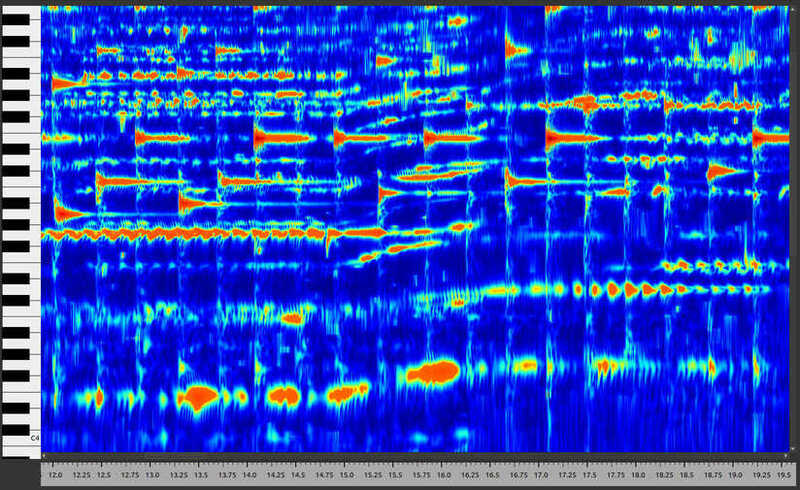 Setting this to a longer note will result in more notes being played together in sheet music, even if they start at slightly different times in the spectrogram. 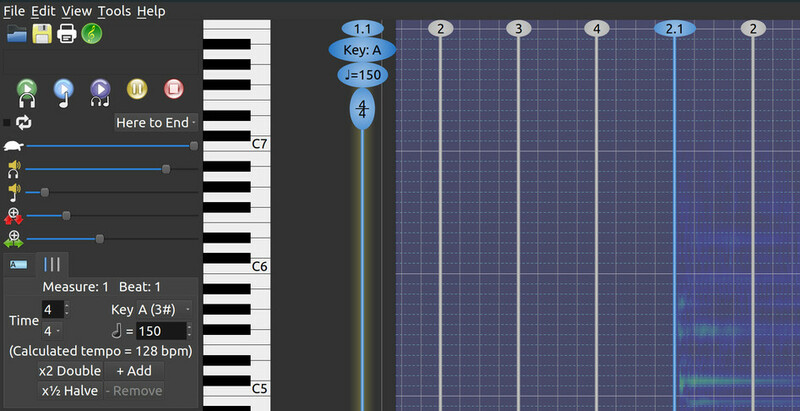 The instrument drop-down box will automatically transpose the sheet music for the key and note range of that instrument and select the appropriate clef(s). In other words, it sets all of the advanced options below to preset values so you don't have to worry about them. The staffs options allow you to move all notes to the treble or bass clef without changing their pitch. Any notes on or above the bass/treble split point will be written to the treble clef. All notes below that are written to the bass clef. The transpose options will shift the pitch of all notes up or down by a fixed number of semitones and/or octaves. The written note range lets you set the lowest and highest possible notes you want to see in the sheet music (after notes have been transposed). When there is a note outside of this range, it will either be moved within the range by changing the octave or removed from the sheet music, depending on the option you select. By checking save as default, you can apply these settings every time sheet music is generated. By default, AnthemScore will use all available processor cores to speed up processing. You can reduce the number of worker threads spawned in File > Preferences. Using more threads also requires more memory, so keep an eye on memory usage by the program and decrease the number of threads if needed. Changing the number of threads will not affect any current or pending jobs, only files opened after the change. It's best to only have one instance of the program running at a time. Multiple instances of AnthemScore will slow each other down and may overwrite shared files. Use the "Contribute File" button if you would like to submit a transcription after correcting mistakes in the automatic note detection. The software uses machine learning to detect notes and the more examples it has of accurate, high quality transcriptions, the better the results. Songs where the automatic note detection was poor are particularly helpful (after they have been corrected). If you submit a file, both the song and notes will be uploaded, reviewed, and may become part of a training dataset. Any edits in an external sheet music editor will not be picked up, so please edit the notes within AnthemScore. See the software license agreement for legal information. When you contribute a file, you are permanently donating the data. A spectrogram of the song will be displayed in the main window. A spectrogram is a color plot of the energy at different frequencies over time. By default, the horizontal axis is time and the vertical axis is frequency (log scale), but this can be changed in the view menu. The color shows the amplitude. Dark blue/black indicates low amplitude and red indicates high amplitude. If the "note lines" box is checked, horizontal lines are drawn at the boundaries between the 88 piano keys. You can move the mouse over a line to see the name of the note and left click to listen to it. 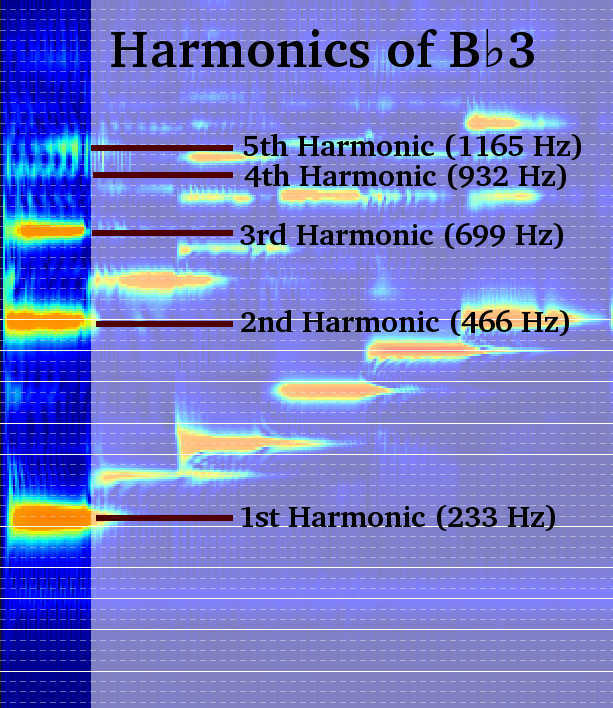 Check the mouse harmonic lines box to see the the harmonic frequencies. Those harmonic lines are the locations that you would expect to see a high amplitude if there was a note at the mouse cursor. Harmonics are equally spaced. They appear to grow closer together here because frequency is on a logarithmic scale. When a note is played on an instrument, the air vibrates at multiple frequencies, called the harmonics of the note. The pitch of the note is the frequency of its first harmonic. For example, when you play C4, or middle C, on the piano, the piano string vibrates at the frequency of C4 (261.63 Hz). But it also simultaneously vibrates at multiples of that frequency: 523.26 Hz (C5), 784.89 Hz (G5), 1046.52 Hz (C6), etc. You only hear a single pitch because your brain recognizes that the frequencies are multiples of 261.63 Hz and groups them together. Usually the 1st harmonic is the strongest and each successive harmonic is weaker, but it can vary. For example, the clarinet has strong odd harmonics (1, 3, 5, 7, ...) and weak even harmonics (2, 4, 6, 8, ...). The relative amplitude of the different harmonics is partly what gives different instruments their characteristic sound, or timbre. Sometimes the 1st harmonic may be missing entirely and the only way to identify the note is to look at the spacing between harmonics. It's also possible, and quite common, for two notes to played together where one note falls on a harmonic of another note (for example C4 and C5, which are an octave apart). When this happens, the higher note's harmonics will be hidden by the lower note, unless they stand out from having stronger amplitudes or small differences in timing. Drums usually occur at lower frequencies and can be identified as features that are narrow in time and very wide in frequency. Percussion instruments often produce frequencies that are are not harmonic (not multiples of a fundamental frequency). 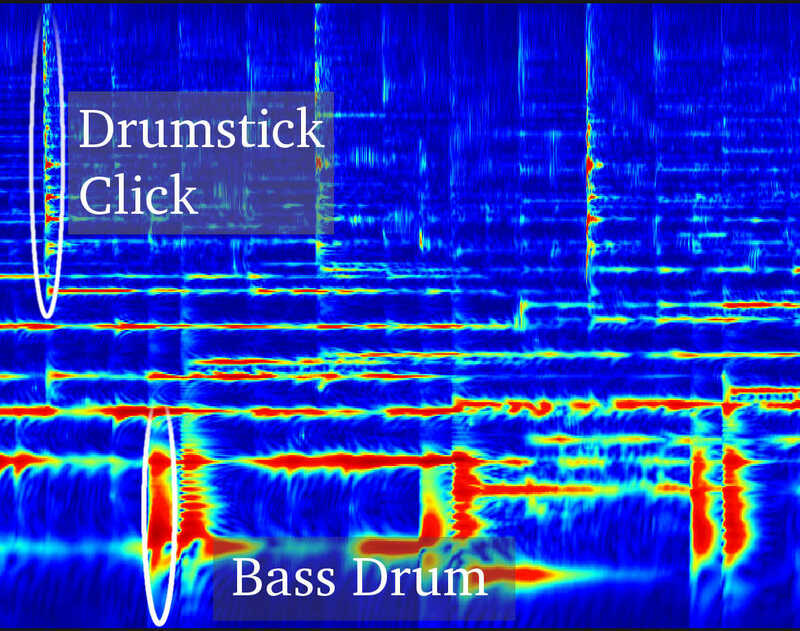 Repeating bass drum at low frequencies and drumstick clicks at high frequencies. Both are narrow in time and wide in frequency. See a few examples of what music looks like.